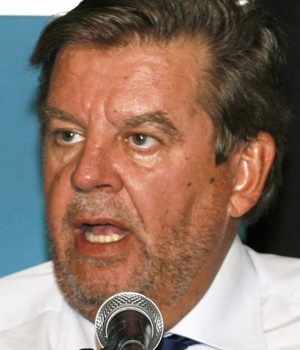 Zurich - South Africa's richest man, Johann Rupert, said “radical economic transformation,” the policy championed by President Jacob Zuma to reduce racial inequality, is no more than theft. Former public protector Thuli Madonsela alleged in a November report that Zuma allowed members of the wealthy Gupta family, who are in business with his son, to influence Cabinet appointments and the award of state contracts. And a study released in March by a team of academics concluded that Zuma, the Guptas and their allies had orchestrated “a silent coup”, securing control over key positions in the state, enabling them to allegedly steal billions of rand. Zuma and the Guptas deny wrongdoing. Zuma’s spokesperson Bongani Ngqulunga said he was in a meeting when called for comment. Bell Pottinger, the UK public-relations firm founded by an adviser to Margaret Thatcher lost clients and staff over its controversial work for the Gupta family in South Africa and was expelled from the UK’s PR trade body last week. It was slammed for stoking racial tensions by mounting a campaign targeting so-called white monopoly capital, and filed for administration on Tuesday. Its targets included Rupert, who has a net worth of $8.2bn. Deputy President Cyril Ramaphosa, a former labour union leader who helped draft the nation’s first democratic constitution and made a fortune in business, is favoured by many investors. His main rival is Nkosazana Dlamini-Zuma, the former chairperson of the African Union Commission and Zuma’s ex-wife. On the campaign trail, Ramaphosa, 64, has emphasised the need for inclusive economic growth, while Dlamini-Zuma, 68, has echoed Zuma’s calls for “radical economic transformation” to address racially based income disparities that date back to white-minority rule. Zuma and his allies in government have proposed expropriating white-owned farmland without compensation and boosting the proportion of mining assets that must by law be owned by black South Africans.